An umbrella for golf is not the same as a regular umbrella because it is usually much larger with the average being between 60 and 70 inches. The additional size provides protection for both the golfer and their club from the wet weather. The best golf umbrella for wet weather is the Procella 62 Inch Wind Resistant Umbrella that provides great protection against sunlight, wind and rain. There is a choice of 8 different styles for the savviest of golfers to choose from. Another difference is that golf umbrellas can withstand winds of 60 MPH by using a strong canopy. Although its highly unlikely you will be playing in such conditions, its always something to talk about in the clubhouse. Golfing is one of the very few games that you can play in the rain. However, without a golf umbrella, you will certainly get wet, which can result in poor performance from lack of grip on the wet club or feeling uncomfortable in wet clothes. 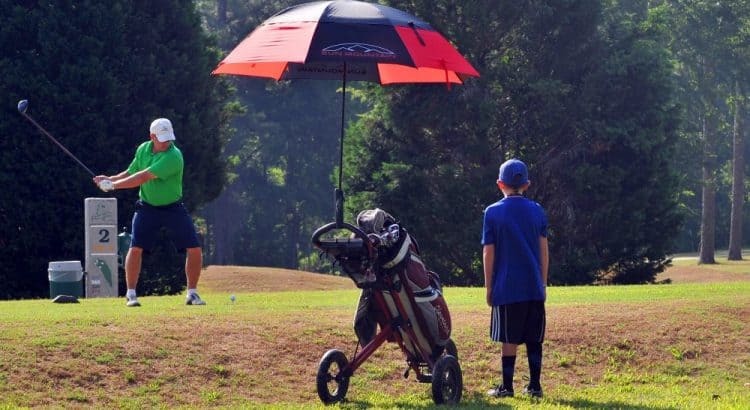 To prevent your clubs from getting wet, the Bag Boy Umbrella Holder is the perfect answer. It simply clamps onto your golf trolley and holds your golf umbrella over the clubs, instead of the golfer needing to hold it. Below is a list of the best golf umbrellas for the money. They are an essential piece of equipment for playing golf in the wet and can be used for non-golfing scenarios too. The highly rated Procella Golf Umbrella is a huge 62 inch waterproof and windproof umbrella perfect for golfing in the wet weather. To prevent rusting like many cheap alternatives, the ribs and shaft are made from high-quality fibreglass. 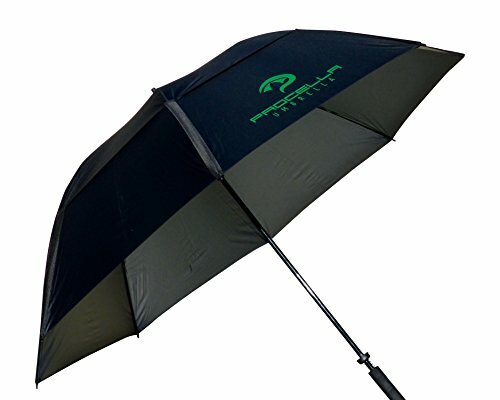 The Procella golf umbrella weighs just 1.7 pounds yet can withstand strong winds to up to 46 MPH. To keep the shape of the umbrella under windy conditions, the frames flex for additional protection. In order to increase the wind resistance and so it doesn’t fly away, the umbrella has a double canopy in the middle to increase ventilation. Matched with the fiberglass shaft and ribs, this umbrella is almost unbreakable. If it does break, contact Procella with the evidence and they will replace it. If your hands do get wet, the grip is a “non-slip” high-quality handle to prevent movement. Overall, the Procella umbrella for golf is light, sturdy and ticks every box. 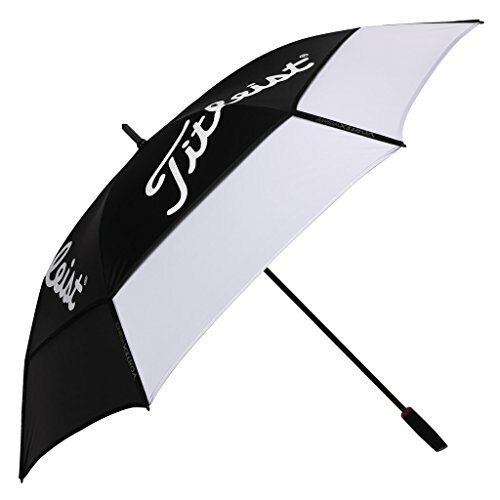 It is the best golf umbrella for the money that can handle the majority of rough weather conditions. If you want to add a touch of class with a major golfing brand displayed onto your umbrella, Callaway has the answer with their huge golf umbrella. This is the largest golf umbrella you can buy that is high quality, it is 68 inches in diameter. To ensure that the golf umbrella is windproof, it has a double canopy with many small ventilation holes to let the wind pass. 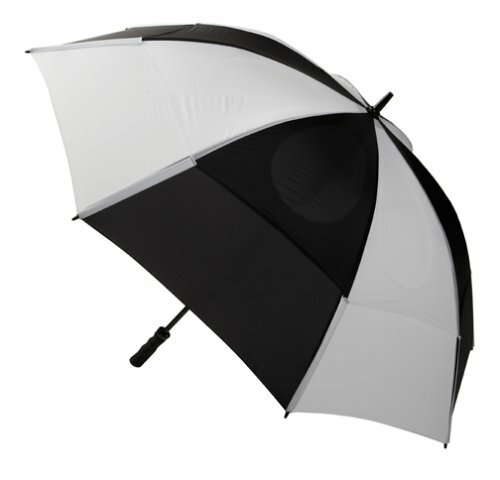 To pop open the large umbrella, there is a simple push button and it will automatically open up. Many golfers will use an umbrella to block the sun. The Callaway umbrella has a UV 50+ protective layer so that the sun will not pass through and the nylon does not become damaged. The grip has been designed for efficiency and tested countless times by Callaway. It is moulded to suit a hand and of course uses non-slip material. The majority of golfers buy the Callaway umbrella because of its size. It is the best large golf umbrella you can buy and will last a very long time considering it was made by Callaway. Fighting the wind with your umbrella is not fun in both a golfing and non-golfing scenario. Luckily, the GustBuster Pro Series has the answer with the best windproof golf umbrella that can withstand winds over 55 MPH. The GustBuster Pro has many famous PGA tour player users that require a windproof golf umbrella. The manufacturers are that confident with their umbrella, they offer a limited lifetime warranty, which is rare of an umbrella. Using a patented double canopy design, the vents allow the wind to pass through with the ribs and spreaders flexing to maintain the shape. It is 62 inches in diameter that is more than adequate for use on a wet golf course. If you are looking for the best windproof golf umbrella that is reasonably priced, the GustBuster Pro is the best buy. 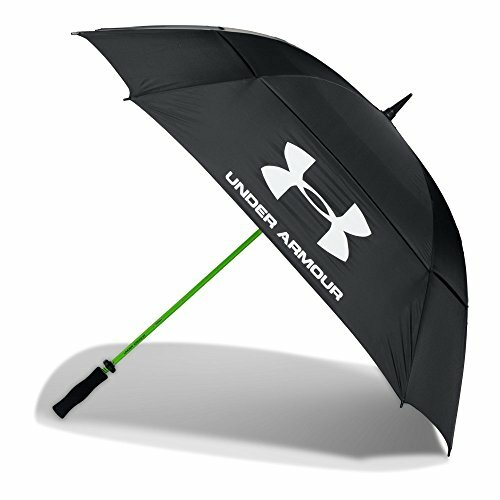 Under Amour are known for their durable clothing and equipment and this golf umbrella is no different. As with the alternatives, it is a double canopy design for increase windproofing and also repels water with clever UA Storm technology. The Under Amour Golf Umbrella unfolds into more of a square than the usual umbrella shape. This gives it a slightly larger coverage of 68 inches, which is the same as the Callaway golf umbrella. Overall, it is one of the lightest golf umbrellas in this article at 1.5 pounds and is of very high quality. 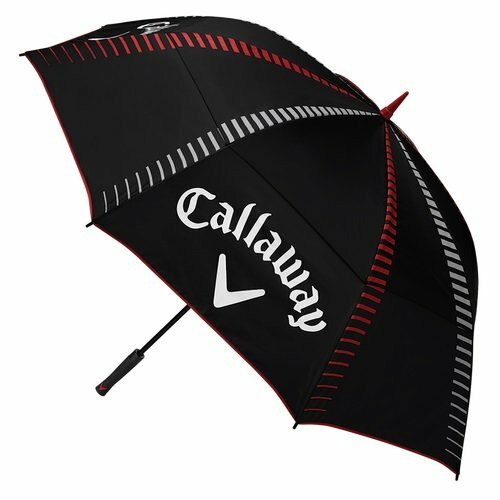 Personally, I would still go for the Callaway umbrella if you are looking for a large umbrella because the Under Amour model does not have an automatic pop up and you have to do it manually. However, on the flip side, it is much cheaper, which might be a better positive. Titleist are another big golf brand that produce the highest quality of golf gear on the market. Their golf umbrella is made from a lightweight graphite construction with a double canopy design that comes with a limited lifetime warranty. Out of all the umbrellas within this article, it is the best-looking golf umbrella and backed by a golfing brand. It has also been tested in a wind tunnel to increase the windproofing. The diameter is 68 inches with the Titleist logo printed on the outside layer. Overall, it is a high-quality umbrella that looks great out on the course but also keeps you dry at the same time. The standard umbrella will simply not be as much use as one designed for golfing use. This is the reason why they are generally more expensive but the extra cost goes into further research and development into materials, windproofing, waterproofing and sunlight protection. The golf umbrella is usually over 60 inches for maximum coverage with a sloped design for the canopy. Some golfers may opt to go as big as 68 inches such as the like of the Callaway and Titleist golf umbrellas above. The purpose of the larger diameter is to divert the rain as far away as possible from you and your golf clubs. Regular umbrellas will not be able to do both as the diameter is too small. Rain during the winter months usually brings strong winds, which added to the large diameter of the umbrellas, can cause havoc. Therefore golf umbrellas require double canopies that allow wind to pass through vented gaps. Golf umbrellas are usually tested thoroughly and can withstand gale force winds up to 55 MPH in most cases. The ribs inside of the umbrella are usually flexible so that the shape stays the same regardless of the wind force. The importance of high-quality materials used within golf umbrellas is paramount. As they are often used in the wet and then stored when damp, corrosion can occur with many cheap umbrellas. To avoid this, the best golf umbrellas will use materials such as graphite or fiber glass that are both very strong. On top of this, the high-quality golf umbrellas will be light even with a huge diameter. The majority weigh less than 2 pounds, which is certainly lightweight. The best golf umbrellas use non-slip material that is comfortable on the hand. Rain will make cheaper grips slippery, which is hardly ideal. Additional, some umbrellas may include foam or moulded grips to further enhance the umbrella experience. Once you are taking your shot, you clearly cannot hold an umbrella at the same time and it has to be stored elsewhere. Some high quality electric trolleys will already contain a golf umbrella holder but if not, the Bag Boy Umbrella Holder is an excellent alternative. Without an umbrella holder, you will either be placing it onto the wet golf course or forcing it down your golf bag, which is bound to break something. Umbrella are also great at blocking the harmful UV rays transmitted from the sun. Many golfers will stand under their umbrella to avoid the sun and keep cool. Not all umbrellas will have UV protection but premium golf umbrellas will such as the Callaway model. Umbrellas are designed to be strong and durable, which is the main reason for the increase in price compared to regular umbrellas. Of course, you can go for cheap golf umbrellas but all that will happen is buying another because it will break. High-quality golf umbrellas come with an excellent warranty, with some being limited lifetime warranties. All five mentioned above are the best golf umbrellas for the money, with many costing double that the most expensive in this article.